The next 5 years will hold more change for the advertising industry than the previous 50 did. Increasingly empowered consumers, more self-reliant advertisers and ever-evolving technologies are redefining how advertising is sold, created, consumed and tracked. Our research points to four evolving future scenarios – and the catalysts that will be driving them. Traditional advertising players – broadcasters, distributors and advertising agencies – may get squeezed unless they can successfully implement consumer, business model and business design innovation. Attention – Consumers are increasingly exercising control of how they view, interact with and filter advertising in a multichannel world, as they continue to shift their attention away from linear TV and adopt ad-skipping, ad-sharing and ad-rating tools. Creativity – Thanks to technology, the rising popularity of user-generated and peerdelivered content, and new ad revenue-sharing models, amateurs and semi-professionals are now creating lower-cost advertising content that is arguably as appealing to consumers as versions created by agencies. Our survey suggests this trend will continue. Measurement – Advertisers are demanding more individual-specific and involvementbased measurements, putting pressure on the traditional mass-market model. 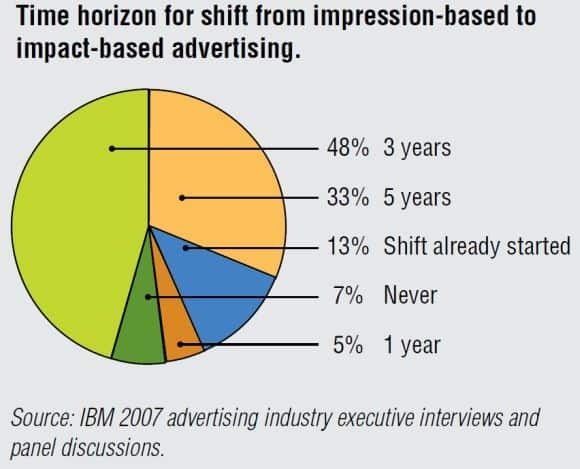 Two-thirds of the advertising executives IBM polled expect 20 percent of advertising revenue to shift from impression-based to impact-based formats within three years. Advertising inventories – New entrants are making ad space that once was proprietary available through open, efficient exchanges. 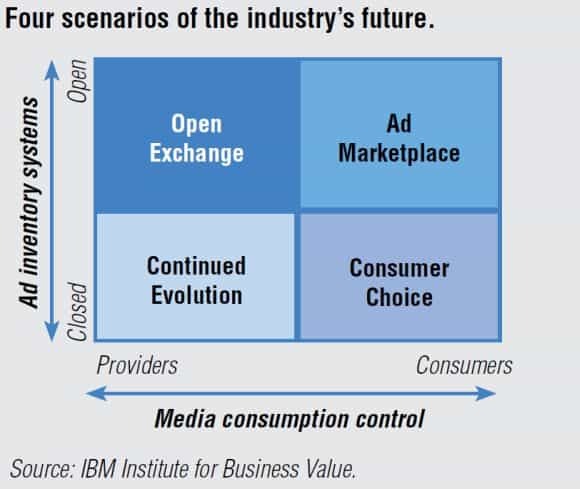 As a result, more than half of the ad executives interviewed expect that open platforms will, within the next five years, take 30 percent of the revenue currently flowing to proprietary incumbents such as broadcasters. New platform players are offering advertisers the ability to purchase ads via aggregated networks. These capabilities provide key benefits such as: improved inventory management, improved pricing transparency, streamlined buying/selling processes, and improved analysis and reporting capabilities. Get the full thing by IBM Institute for Business Value or a two page executive summary. Yes! The point is that information in this report is unbelievable for most even today and next year. But the message is slowly spreading. Old news. Has no one noticed this report was published 2 years ago? A new media world has arrived. Pioneered by teens and gadget-savvy professionals, it has quickly spread into virtually every consumer segment, and started to encroach on traditional media. The number of unique visitors to MySpace.com has now surpassed the 50 million mark – something akin to the number of U.S. households that tune into the Super Bowl. Every day, consumers around the world watch about 100 million videos on YouTube – putting that number in context, the top 15 British primetime television shows combined attract about 100 million viewers, as do the top 4 U.S. shows. * TV consumption is expected to rise, in part due to the appeal of new technologies which allow increased control over when, how and where content is viewed.